How to find number of days and weeks for given month in Java? Home Medium Date Questions How to find number of days and weeks for given month in Java? Write a program in Java that displays number of days and weeks for given month with proper validations. We know that number of days are constant for each month except February because for leap year there are 29 days and for other years 28 days. So in this problem if any user enter month name as February then he has to enter year also for finding number of days. The Solution is very simple and straight forward. We are using switch case for finding number of day and division/remainder mechanism for number of weeks. How to check whether given year is a leap year or not? * @problem Number of days and weeks per month? 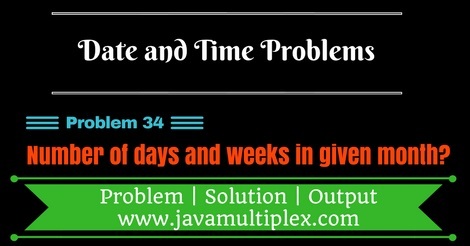 Tags : Date and Time problems, Days and weeks for given month, Solution in Java, String, if else statement, List, ArrayList, Regular expressions, switch statement, Leap year.